This album is like a breath of fresh patchouli’d air wafting unannounced across your nostrils from a wormhole connecting to an alternate universe where Hawkwind are still narrating imminent Sonic Attack. One is transported back to a lysergic wasteland of a long forgotten Stonehenge Free Festival in a haze of teary-eyed nostalgia, where Hawkwind are blasting out the soundtrack to the psychedelic warlords’ annual dinner and dance, possessed of a joie-de-vivre and an energy that would put bands a quarter their age to shame. Bloody marvellous stuff! This is of course a concept album, based on E.M. Forster’s 1909 sci-fi short story of the same name. Having had Passage To India drummed into me for Eng. Lit. ‘O’ Level about three hundred years ago, that was as far as I went with Forster’s books, my appetite dulled by academic rote. I had no idea he’d written a sci-fi story, and if the tale played out here is anything to go by, I may well search it out. The album opens with a Sonic Attack parallel, with the cagily named Mr Dibs doing the Robert Calvert-reads-Moorcock with some sinister style. 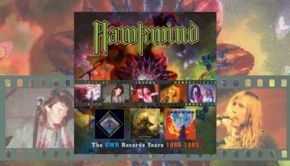 Then it’s straight into a classic slab of four chord amphetamine fuelled sci-fi rock of the kind I’ve not heard Hawkwind dish out since the end of the ’70s. The Machine, and indeed the pummelling riffola of King Of The World remind me of this band at their peak, and the unsurpassable Space Ritual, which is of course the best live album by anyone, ever. Frankly I’m surprised, because after drifting away from the band at the end of the ’70s, with a brief return for Chronicle Of The Black Sword, the only other time our paths have crossed since was at a distinctly underwhelming gig back in 2004. The band, then reduced to a guitar/bass/drums trio of Dave Brock, Alan Davey, and Richard Chadwick had to rely on a laptop for a lot of the music and there was no stage sideshow for distraction, the end result being a flat and somewhat dispiriting experience. 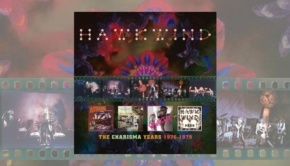 Of course, Dave Brock is still there, it wouldn’t be Hawkwind without him, and so is drummer Richard Chadwick and this beast of an album is the exact opposite of that 2004 listless Hawkwind-by-numbers routine, for it is possessed of a boundless energy that takes you back to the band’s prime. In classic ’Wind style the upbeat numbers are linked by timeless spacerock psychedelics, voices off, and sonic and rhythmic exploration to the slower four chord symphonic cosmic ballads any ’Wind fan will be familiar with. 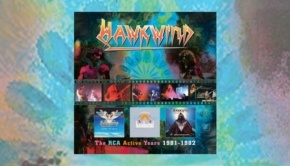 It seems the more things change, the more things stay the same, which in Hawkwind’s case is definitely a good thing. Synchronized Blue, which like the rest of this album can only benefit by being played at volume 11, reminds me of Urban Guerilla as it echoes that song’s predating punk’s speedfreak charge by a good three years. Lemmy will look down on this album, or more likely up at 45 degrees, and grunt in approval I’m sure. If I had the long hair I had in 1975, I’d be headbangin’ like a fool. It’s not all from the ’70s United Artists-era template; Hexagone is a delicate space ballad that Syd Barrett would be proud of, with the most fragile of vocals from Dead Fred, who wrote it and played all the instruments on it too. That’s an exception as most everything else here is penned by Brock. Other template departures are The Harmonic Hall, which is a synth-driven instrumental with a snake charmer rhythm and a beguiling Middle Eastern atmosphere, and Living On Earth, an unfolding melody that even briefly features an uncredited hoedown fiddle. 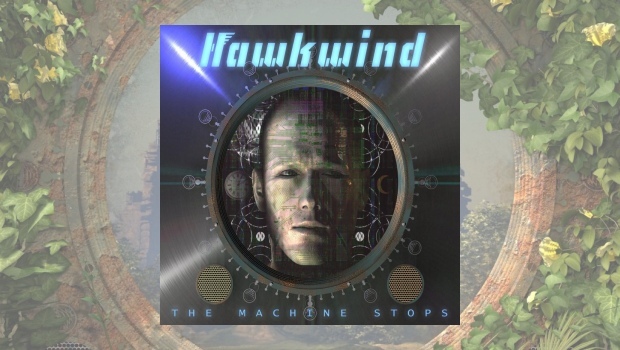 Solitary Man, the album single – I didn’t realise there were such things any more – is a classic Hawkwind rocker with a pounding bass line from Mr Dibs that Mr Kilmister would let pass ‘Go’. It will have you shaking what’s left of your hair in a joyous nostalgic fashion, but watch you don’t crick your neck! The core band on this record is again a trio, consisting of Dave Brock and long-serving drummer Richard Chadwick, and on the bass Niall Hone, Haz Wheaton, or Mr Dibs. 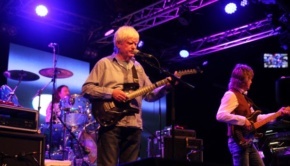 It was good to read that the recent tour to promote the album – damn, missed again! – was performed by a full band, fleshed out with keyboards and effects, as The Machine Stops deserves the full treatment. The first five tracks run through without a break, in true conceptual fashion, and the prescient story of dystopian dominant technology, the homogenisation and isolation it causes, and eventual societal breakdown as a result of over-reliance unfolds in an unhurried but menacing fashion. This is a Hawkwind space opera writ very large, of the kind not heard – by me at least – for decades, and bloody marvellous it is too. I wouldn’t know if this album is a return to form as I’ve been away for so long, but judging by reactions I’ve read elsewhere, and the fact it shot up the album charts, not to mention the daft grin it leaves on my ugly old fizzog, I’d say Yes Siree, it sure is! Now where’s that badge-festooned denim jacket? I think it needs the dust shaking off it and a good soaking in patchouli. The only problem is there’s no chance it will fit after all these years!